Contours Travel supports a number of initiatives throughout Latin America. Whether it is through direct loans, importing artisanal products or through supporting local development organizations, we are trying to increase opportunities for the people of this wonderful continent. We invite you to visit rural communities and experience the work of these organisations firsthand. Contours Travel will donate 1% of total land costs for any client who visits and contributes to any of the below organisation’s work. Ask us for more details about volunteering options in Latin America. The initiatives and organisations below are just a few of the ways in which we are trying to give something back to the locals. With the simple act of turning on a tap, we have access to clean, drinking water. Unfortunately, this is not the case for children in rural areas of Peru, Ecuador and Bolivia. Throughout these countries, many drink contaminated water comes directly from springs. Contours Travel has joined forces with Rotary Club of North Melbourne and created Agua Pura Project. Agua Pura is a community project that relies on donations made by people like you: fellow travellers, travel agents, and small and large businesses. 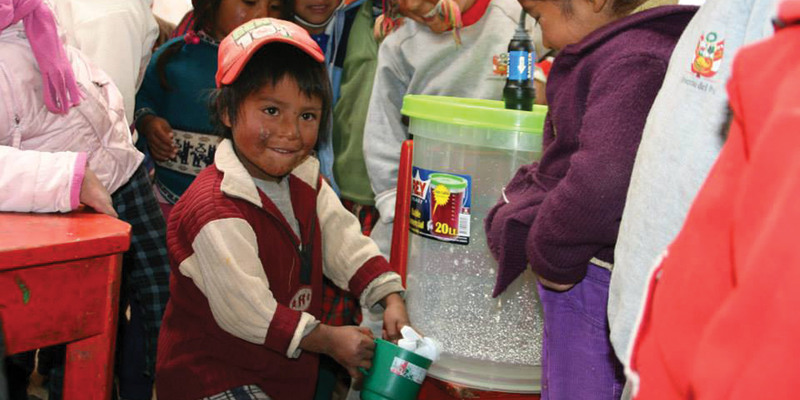 Agua Pura Project’s donations go towards buying and sending Sawyer Water Filters to local communities in Peru providing them with access to safe drinking water. You also have the unique option of volunteering to go to the communities to distribute the water filters, as part of your travel itinerary.Learn more about Agua Pura here. Wings Working Together is the not-for-profit branch of our Peruvian partners Condor Travel. Their pilot project in the village of Misinmay has had some important successes in creating economic and social opportunities for local people- local men have been trained as porters for the Inca Trail, literacy and textile classes have been offered to the village women and children are targeted through education and health care initiatives. Tourists are welcomed as volunteers to help in a range of activities or simply to visit as guests to learn more about the work of the organisation. The first priority in each community in which Peru’s Challenge works is to see that the school is transformed into a safe, happy learning environment supported fully by the government and community. The organisation then turns its focus to the community as a whole through Project for Life, to ensure that each member enjoys the opportunity to have their needs met and enhance their quality of life. Peru’s Challenge welcomes our clients to spend time working and learning alongside local communities in the Cuzco region – cash or in-kind donations help the organization continue their excellent work. Since 1999 our Ecuadorian partner Explorandes has been working with indigenous women artisans from the province of Imbabura in northern Ecuador. Their goal is to assist poor women in rural areas by helping them improve their craft, providing a market for their products and offering classes in women’s rights & health. Trips to see the work of these women and learn more about the project can be arranged as an easy side trip from Quito or Otavalo. Ask us for details. Living Heart is a registered Peruvian charity and official UK Charity supporting various communities situated in the high Andes around the Sacred Valley of Peru, near Cusco, and has been since August 2007. Their main areas of focus are nutrition, health, education and conservation. Their evaluation initiative is always carried out prior to making an agreement with a community to offer their support in these areas. In this way they are able to know that their support is going where it is crucially needed, especially to disadvantage and chronically malnourished children.